It may be a small country, but sand-strewn Jordan is big on appeal. It may be a small country, but Jordan is big on appeal. Relics of bygone civilisations and the stark beauty of the desert landscapes combine to make a truly awe-inspiring destination. This is a country where a true sense of biblical history and traditional customs mingle with an enticing and welcoming contemporary culture. The breathtaking natural scenery is also a major draw. From the russet cliffs of Wadi Rum and the white salt deposits of the Dead Sea, to the green hills of Ajloun forest and the sparkling turquoise of the Red Sea, there’s natural drama at every turn. The rosy jewel in Jordan’s crown is undoubtedly Petra, the ancient Nabatean capital of astonishing grace, hewn from the rippled reddish rock so long ago and still possessing a haunting beauty rarely matched anywhere. There are countless wonderful experiences to be had in this desert gem. 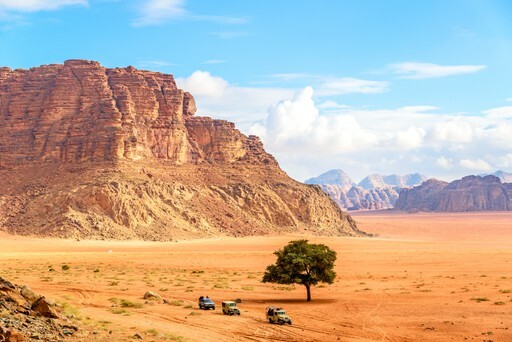 For further inspiration take a look at the trip ideas put together by our trusted local experts at the foot of this page, but in the meantime here are our top three things to do in Jordan. 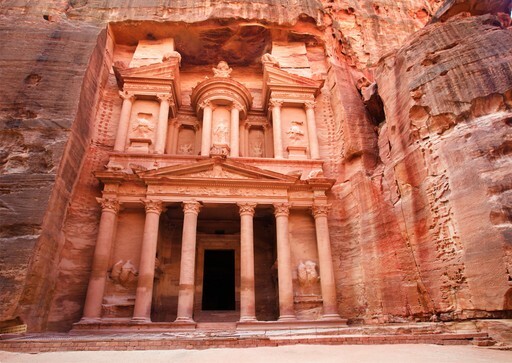 No trip to Jordan would be complete without seeing the intricate rose red remains of the ancient city of Petra, carved out of the sandstone cliffs over 2,000 years ago. The anticipation mounts as you approach through the Siq, a narrow cleft in the rocks which suddenly opens out opposite the breathtaking facade of the Treasury. Being such a famous attraction, Petra is naturally very busy, but our local experts know the ins and outs and how to see the fabulous ruins whilst avoiding the worst of the crowds. Experience the uncanny sensation of floating on the salty waters of the Dead Sea, so buoyant that you can't actually swim. A combination of the rich mix of minerals in the water and the air, coupled with the unique atmosphere at the lowest point on earth promote health and general wellbeing, and have an especially beneficial effect on the skin and the rheumatic system. The colours also make for some spectacular photo opportunities. Like stony ships in a sandy sea, the looming crags of Wadi Rum would make an evocative desert experience even without the nomadic Bedouin to add a human dimension to the arid landscape. For the most immersive experience, spend some time hiking or riding through the silent wadi, and spend a night or two in a Bedouin camp, perfect for a cultural experience and some fantastic stargazing. When should I visit Jordan? 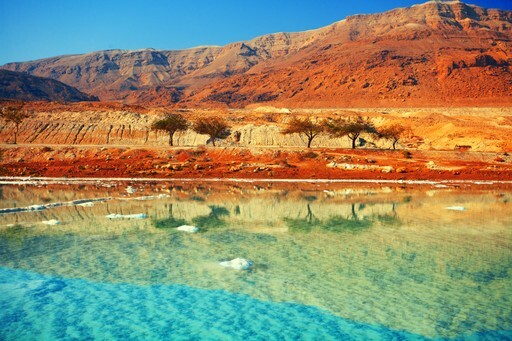 Jordan is enjoyable at any time of year, although perhaps the best times are between March and May, and between September and November, when temperatures hover around 25 degrees Celsius. Summertime, from June to August, can be roasting hot, nudging 40 degrees, so follow the lead of the locals and take a nap after lunch to avoid the worst of the heat. Wintertime can get chilly, and can even see snowfall, although this does mean that you can enjoy more solitude at the sites. 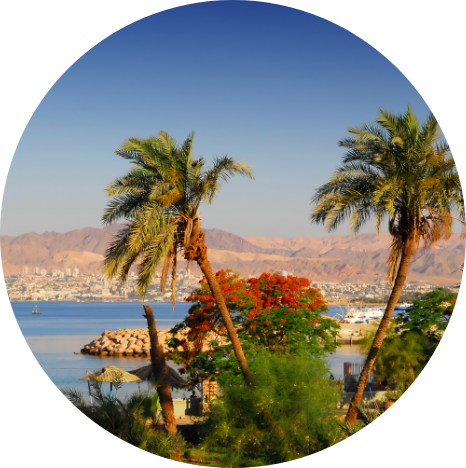 Even in winter Aqaba on the Red Sea enjoys beautifully warm weather and bright sunshine. Create your bespoke holiday to Jordan!